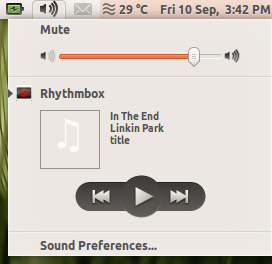 There was a really annoying bug with Rhythmbox in Maverick which let the music player to terminate whenever a user clicked on the close button. I too, out of habit from Lucid used to click on close button and the music player would go off. The bug has been fixed now in the new Maverick update and everything works fine except that now the Rhythmbox icon have disappeared from the sound indicator.